Rita’s touching novel is free to borrow on Kindle March 8–12 in honor of International Women’s Day. I recently had the pleasure of editing a debut novel by Rita Costick, Ph.D. Her thought-provoking book, Fearless: On the Wings of Forgiveness, makes a perfect read for anyone who believes in the power of friendship to see you through life’s challenges. The book premise involves a heartwarming glimpse into the lives of five former female roommates who reunite for a long weekend at a beachside California vacation cottage and, while reconnecting after many years, demonstrate the healing power of friendship and the unquestioned stamina of forgiveness. In celebration of International Women’s Day, Rita is making available the Kindle version of Fearless for free this weekend — March 8, 9, 10, 11, and 12 — at Fearless Kindle Edition. A print version is also available for purchase through Amazon Books at Fearless Paperback Edition. See? A book you don’t want to miss. P.S. 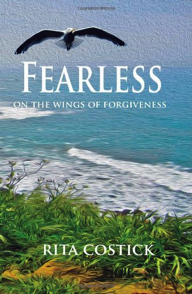 Jot a reminder on your calendar right now to borrow Fearless: On the Wings of Forgiveness this weekend. P.S.S. Please share your gratitude for/experience with a specific friendship, a powerful forgiveness, or a moment of fearlessness in the comments below. This entry was posted in All Posts, Village: You+Me+Us, Words: Serious Play, Writing tips and tagged Ann Narcisian Videan, Ann Videan, Fearless: On the Wings of Forgiveness, International Women's Day, Rita Costick, writing by Ann Videan. Bookmark the permalink.